Crafted for immersive, high-definition gaming and VR applications, the 17.3" Alienware 17 R5 Laptop from Dell balances power and portability. It is equipped with a 2560 x 1440 G-Sync display with 400 cd/m2 brightness, a 120 Hz refresh rate, wide viewing angles, and an NVIDIA GeForce GTX 1080 graphics card. With a dedicated graphics card, you'll be able to crank up in-game visual settings and enable additional graphical eye-candy options to enjoy your games at their best. Balancing out the rest of the system is a 2.9 GHz Intel Core i9-8950HK processor and 32GB of 2400 MHz DDR4 RAM that'll allow you to efficiently multitask and quickly access frequently used files and programs. For storage, the Alienware 17 R5 has a 256GB PCIe M.2 SSD and a 1TB 7200 rpm SATA III 2.5" hard drive, which deliver a total storage capacity of 1.256TB. If you want to take advantage of external storage or connect peripherals such as optical drives, memory card readers, printers, and more, this can be done using one USB 3.1 Gen 2 Type-C port, two USB 3.1 Gen 1 Type-A ports, one of which features PowerShare technology, and one Thunderbolt 3 port, which also supports USB 3.1 Gen 2. Furthermore, using its HDMI 2.0, mini-DisplayPort 1.3, and Thunderbolt 3 ports, you can connect external displays for extensive multitasking. 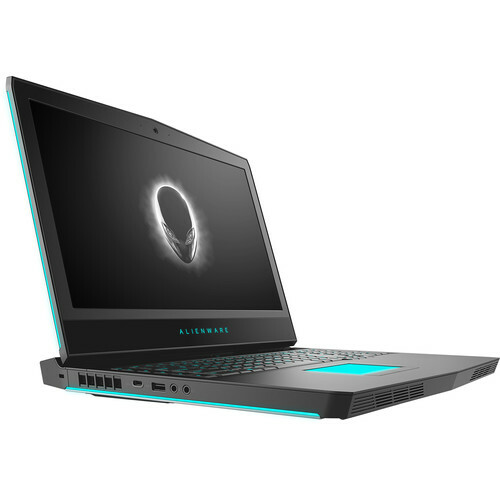 Other integrated features include a Full HD webcam, Gigabit Ethernet, 802.11ac Wi-Fi, Bluetooth 5.0, a headphone/mic combo jack, a headset jack, stereo speakers, and Alienware's TactX keyboard with N-key rollover, 9 user-programmable keys, and 4-zone, multi-color RGB-LED AlienFX lighting. Included is a power adapter and a 6-cell / 99Wh lithium-ion battery. The installed operating system is Windows 10 Home (64-bit). The memory can be upgraded to 32GB using a 16GB module in each of the 260-pin SO-DIMM slots. The system's internal storage can be upgraded or added to, as there are three M.2 SSD slots (one 2242 for SATA III & NVMe PCIe, one 2280 for SATA III & NVMe PCIe, and one 2280 for NVMe PCIe), as well as one 2.5" SATA III drive bay. NVIDIA G-Sync technology syncs the display's refresh rate with the graphics card's frame rate output to reduce screen tearing and ghosting. Combined with a 120 Hz refresh rate, which helps to eliminate stuttering and jitters, you'll be able to enjoy smooth gameplay and react instantly to your game. Dive into mind-bending virtual reality experiences with a VR-ready system that passes the Oculus-ready and Vive-optimized certifications. Powered by NVIDIA VRWorks technology, a level of presence is achieved by bringing physically realistic visuals, sound, touch interactions, and simulated environments to virtual reality. And with an NVIDIA GeForce GTX 1080 graphics card, the Alienware 17 delivers smooth VR performance. Tobii Eye-Tracking technology utilizes a built-in camera to watch your eyes and where they look to. It's implemented in a few games and applications where looking left will pan your camera left and so on, for a more immersive experience. The HDMI 2.0 port can output 7.1-channel digital audio. With an upgraded Alienware TactX keyboard, N-key rollover is now supported, enabling over 108-key commands for more actions per minute, and 2.2mm of key travel allows for rapid keystroke responses. Plus, it's reinforced with a steel backplate for rigidity and uniform feedback and a life of up to 10 million keystrokes. Create a more personalized look for your machine with AlienFX lighting. This RGB/LED-enabled lighting is supported on over 130 games with the option to create and download unique themes. AlienFX lighting features 4-zone, multi-color RGB keyboard with lighting controls. A hinge-forward design brings the thermal shelf to the rear, enabling a variety of improved benefits, such as a thinner overall design while increasing performance, improved ventilation, higher quality sound, and external ports organization. A higher maximum thermal design power (TDP) support means that your system can handle a higher total wattage for internal components, enabling a higher level of performance. With the entire ventilation system upgraded, your system can stay cool even under extreme graphics pressure. Avoid excess cables and embrace the "desktop mode" design, where most of your critical connections and ports are in the back and out of the way. Killer DoubleShot Pro provides a wired and wireless networking setup that prioritizes internet traffic and data streams to the applications most important to you. The Alienware Graphics Amplifier can be connected to this port and enables future-proofing of upgradeable full-length, dual-wide graphics and additional 4-port USB 3.1 Gen 1 hub for added peripherals. With a dedicated PCIe x4 Gen 3 with up to 40 Gb/s throughout, you won't have to worry about the disadvantages that come with a shared connection. Please note that the Alienware Graphics Amplifier is sold separately. The Alienware 17 contains a lithium 6-cell / 99Wh battery. The Alienware 17 uses premium materials to deliver high-performance gaming technology. Utilizing magnesium alloy for rigidity, copper for improved performance, anodized aluminum for extra protection, and steel for tactile comfort, it features a high-quality design for high-performance gaming. AlienFX uses 20 different colors to create over 80 quadrillion unique themes to give your machine a more personalized look. Supported on over 130 titles, lighting zones can be customized to react to things like in-game actions, powering on and off, and notifications by pulsing, morphing, or simply holding a solid color. Once you've finished your theme, you can save and upload it to the Alienware Arena community site where you can share your custom creation with others and download any you find. And for times when you want a little less visual stimulation, AlienFX allows you to "go dark" by disabling all lighting effects until you're ready to turn them back on. The "Always Ready Mode" puts your system in a state in between sleep and awake, allowing core programs to run in the background while the machine runs quietly and in a lower power mode. Featuring customizable game and application options, a system performance optimizer, and a performance monitoring tool, AlienAdrenaline provides users with the tools they need to keep one step ahead of the competition. Change settings and monitor internal temperatures and speeds of certain fans within your Alienware system using the Active Thermals module. Take control of overclocking levels for your memory and CPU with OC controls. Monitor memory activity levels, change settings on the fly, and turn on/off auto start in one convenient place. With customer OC, you can create your own OC mode by making choices in your settings located in the "Customer Menu" section of the BIOS OC screen. Box Dimensions (LxWxH) 20.5 x 18.1 x 4.7"
17.3" Alienware 17 R5 Laptop is rated 4.6 out of 5 by 7. Rated 5 out of 5 by Mariya from Amazing laptop I have to travel between three countries every year, and, therefore, cannot have a PC setup. However, this behemoth became a marvelous replacement for one. Though not very portable (almost 5 kg, what do you want), it is a great laptop that is able run every game Ive tried so far on ultra graphics with 60+ FPS. Alienware 17 R5 is more of a portable PC than a laptop, and this is exactly what I need. Rated 4 out of 5 by Luntian from Powerful but Overheated I just got my order a few days ago, its a really nice device with super powerful specs. The 256gb SSD actually is a Samsung PCIE SSD, the read and write speed match the same size Samsung 970 EVO. And the actual RAM speed is 2666, not 2400. Great, right? The only problem is the heat. GPU temperature is really good, always in the 70C - 78C range when you playing games, but the CPU just totally out of control. Take playing Overwatch, for example, the CPU temperature will maintain at 89C - 93C no matter what video setting you set. In addition, Ill say no matter what game you play, the CPU temperature will be about the same--spicy chip. : ) Overall, this is a very good machine. Although it does have the thermal problem with CPU ( the keyboard surface just fine), so far I didnt see the heat problem affected performance. Besides, when you buying the i9 laptop, you know you gonna face this problem, right? Rated 4 out of 5 by Xu from Still too hot 2nd review after testing. GPU temperature is OK, regardless of load. The CPU is still hovering about 90+ â„ƒ and it feels really hot on the underside and back. keyboard is fine and fans are blowing full blast all the time. Am disappointed that there are only 2 RAM slots limiting the memory to only 32gb instead of 64gb. Also has only 2 pcie m.2 slots, limiting the storage to only 4tb. with such a huge chassis, Dell could do better to at least slot in 4 memory slots & 4 pcie m.2 slots. awaiting to hear more reviews on LM repaste of the CPU. The Heat! Rated 5 out of 5 by Filix from So far I love it It is fast for sure and reliable. It is heavy but you still can put it on your lap. Rated 5 out of 5 by Qi from Great Laptop Performance and quality are great. Does it come with Tobi eye tracking and G-sync? B&amp;H # DEA17R58950S comes with G-Sync and Tobii Eye Tracker support. How can I purchase a 3 Years Premium Support for this laptop? If you add the laptop to your cart, you would see the option to add on a SquareTrade warranty plan. I couldn't find my Windows Activation Key. I tried activating Windows but it says I do not have a valid licence key. Kindly advise where to I find my licence key? Sorry for any inconvenience. If you had to reset your Windows computer and you didn't do a recovery backup for your system, you will need to contact the manufacture or Microsoft to recover your Windows License. B&amp;H won't have access to this. Sorry for any inconvenience once again. You can contact Dell at 800-624-9897 or Microsoft at 800-642-7676, to further assist you with this inquiry. Is this new or certified refurbished? This computer is new in a box not used or refurbished. All items on our site are new unless specifically marked as used, with a condition rating. You will also notice the &quot;Used&quot; tab highlighted at the top of our page. In the overview it lists GPU as 1080, but in the Specs GPU shows as 1080OC. which one is correct? On the Dell website, it only has the 1080OC option. No std 1080 available. Can the 6TB Seagate 2.5 inch HHD (15mm) fit into the AW17R5 ?